No, I do not want to build a snowman!!! Afters Ice Cream doughtnuts were all the rage at the beginning of this year, but as of two weeks ago, there is a new ice cream doughnut joint just a couple miles away...and they've named their creation "The Fronut". 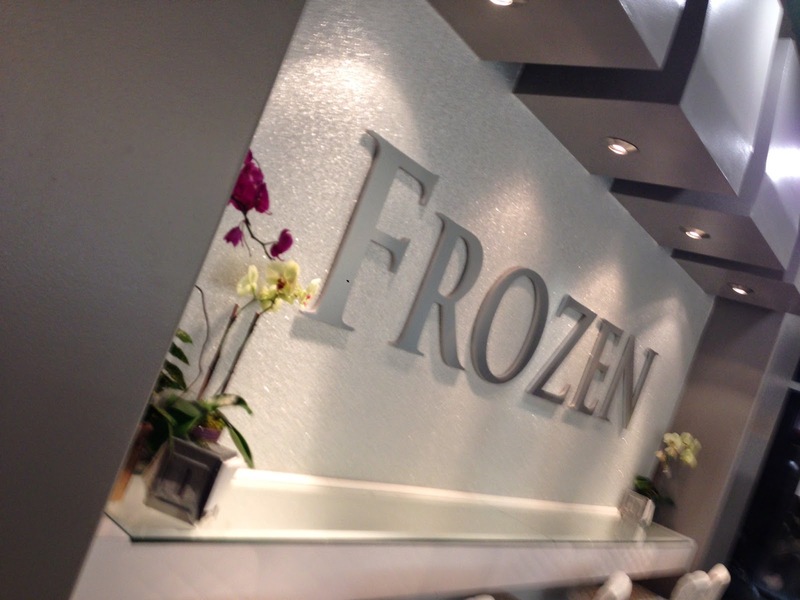 I had the opportunity to chat with the owner of Frozen Bar, the newly opened dessert corner in Garden Grove. Now, this part of the OC is heavily compacted with food options, so if you want to open a store here it better be good enough to keep up with the cut throat competition of surrounding peers. For instance, the ice cream doughnut phenomenon has taken the foodie world by storm. Of course, by the time I finished my conversation with Mr. Frozen Bar, I lost my place in line. Since it was at the end of the night, I also lost the particular shaped gelato bar I wanted to some other customer in line while I was gibbering away. The kind girl at the counter, bless her heart, gave me a chance to order without standing back in line, so all was well in the land of FROZEN. 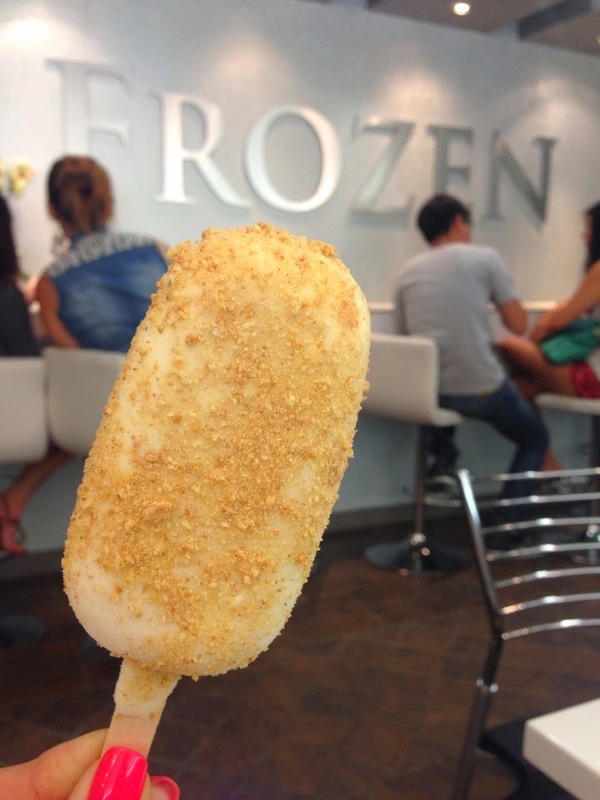 Frozen Bar offers ice cream filled doughnuts, gelato bars, and original ice cream flavors. They have preferences that are more for the cultural taste buds, such as durian ice cream in a Pandan waffle cone. I came for the gelato bars though because, quite frankly if you haven't noticed, I've had an ice cream overload so I thought I'd switch it up a bit. 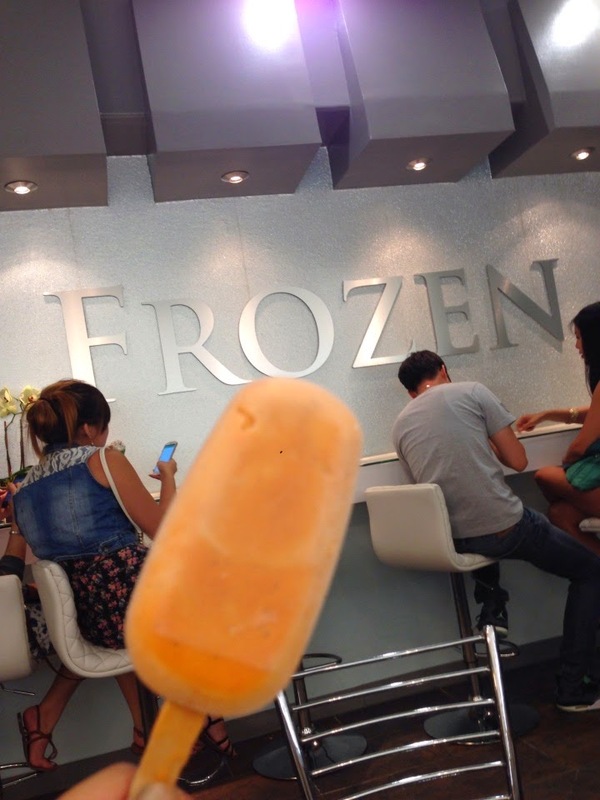 For those who are trying to stay away from too much sugar, Frozen Bar's selections are pretty light on the sweet. It is just barely open for business, so I can't make too many strong opinions because I believe you can't judge fledgling stores too critically. I do see a potential for the store to be a favorite this summer because of some of the more unique flavor concepts. When you do visit Frozen Bar, let me know if you can't stop replaying "Let It Go" in your head over and over even after you leave the premises. 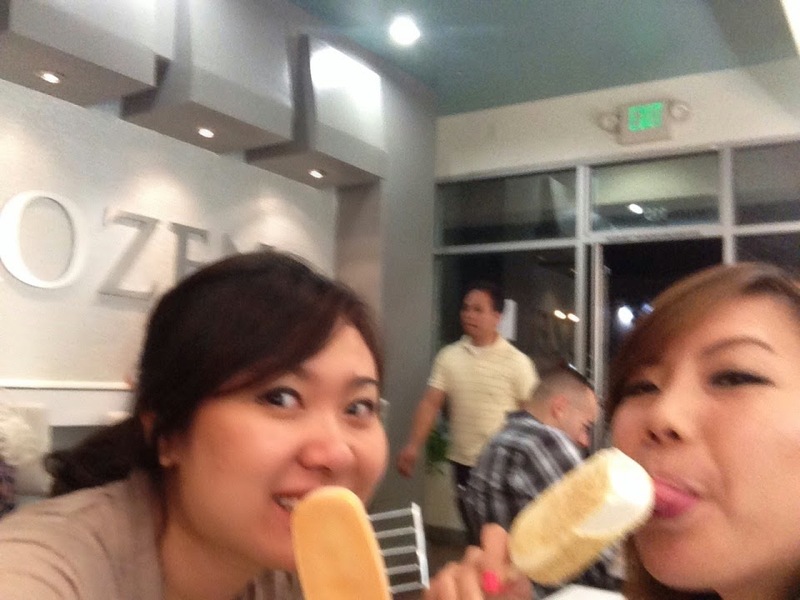 Oh and do me a favor, please add #20DaysofICECREAM with your ice cream photo op. *There's not a lot of info on the their website, but click if you want to anyways. I discourage the use of Yelp to make your final decision on a place, although I myself am guilty of being swayed by reviews as well. Don't rely on ratings to dictate what you eat. If you think a place is good, then try it and who knows, maybe you just have a different tongue for it! *Ultimate FooodisGoood achievement: I got to eat Taylor Swift's freshly baked cookies at her house! Read more. Q&A: What's my favorite food?